Well, we can’t rewrite the movie, but in the real world there are many, many little bookshops (independents) across the country that do coexist with the bigger stores. Just like the movie, they need a lot of help to keep their doors open. And who can save them? Well, we can. All it takes is a little bit of effort on our parts to shop there. If you can't make it into the store, most independents these days offer online shopping, and a buying a book or two (or twelve) there every month makes such a huge difference. The bookstore behind mysterylovers.com is Mystery Lovers Bookshop. We're one of the largest specialty mystery book stores in the country and we've been in business since 1990. In 2010 we were honored by the Mystery Writers of America with a Raven Award for our contribution to mystery writing, particularly our annual Festival of Mystery. We carry a wide variety of crime and mystery fiction including thrillers and some espionage. We carry only new books although we have quite a collection of signed first edition hardcovers accumulated from the visits of hundreds of authors to our store. We do not carry used books although you'll sometimes find an older, out of print book on our shelves or on our website. One of the many great things about Mystery Lovers Bookshop is that you can order ANY book from them. I’ve personally ordered mysteries, romances, and even inspirational women’s fiction. Just ask and they can track down just about any title. Oh, and the best part? They have free shipping on orders over $10 (some rules apply on non-book items). -Every year, Mystery Lovers Bookshop holds the Festival of Mystery, an incredible book fair. Mystery authors come from across the country to sign at the Festival, and crowds of readers line the block outside of the venue. -MLB has a fantastic newsletter. Sign up on their website (main page on bottom right). -Visiting authors to the shop are asked to sign the bathroom wall. It’s quite a sight, and if you’re ever there, make sure you take a peek. -MLB offers a wide selection of signed books. -MLB is a favorite stop on many authors’ book tours. Be sure to check their calendar of events for who’s coming soon. Happy shopping, and I hope I didn't miss anything (please chime in if I did). *As a reminder, this month one lucky commenter will win a $10 gift card to Mystery Lovers Bookshop. The more comments you leave, the more chances you have to win. Having just discovered MLB this spring, I want to jump on the band wagon to say "woohoo!!" The shop itself is lovely -- comfortable, soooo many books, great staff. 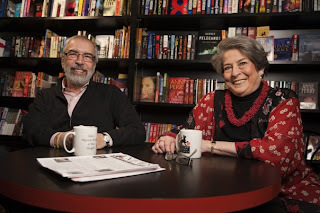 On top of that, Richard and Mary Alice are the bee's knees, and the festival is ... oh boy, if you read or write mysteries, you must get yourself to the festival next year! Dru, you're going to have to haul me out of Mystery Lovers Bookshop, too. Several times. Carrying loads of books... Yeah, I know, you'll be carrying your own. Oh, wait, they ship! We'll be okay, then. See you and everybody else there! Mystery Lovers Bookshop is the best. I was just there last night for an incredible author event with Tess Gerritsen and Lisa Gardner. Richard and Mary Alice rock! Sounds like a great place to visit, wish I lived nearby. I love the fact that they do ship and that its free shipping with a $10 order is amazing. With the larger chain stores you have to purchase at least $25 or $50 before shipping is free. Wishing them great success. Oh how I wish I lived close to this cozy little shop. Small bookshops are a rarity around my house. But this is definitely a place I'll have to go visit-especially to see the signatures in the bathroom! I've just added Mystery lovers Bookshop to our Pennsylvania vacation itinerary! Can't wait to visit and shop. Writing this post reminded me that I need to order the GC! And you know I'll be ordering a couple of books, too. Richard and Mary Alice are both amazingly generous to authors. Their store is wonderful and their Festival a one of a kind experience. All I can say is wow! I consider MLB one of the greatest perks I received with moving to Pittsburgh. If we weren't on such a tight budget I'd practically live there! I love MLB - they are absolutely the best ever! I attended my first Festival this year and was blown away by the enthusiasm, support and kindness of all involved. Let's hear it for indies!!! Sounds like a fun place to visit. Have to check if I can take a bus down. I'm itching to visit MLB. My friends rave about the Festival of Mystery! Maybe someday . . .
Mystery Lovers Bookshop is like a dream come true and well worth the trip. Mary Alice and Richard are very warm and welcoming. They sure know their mysteries. As an author and a reader, I love this store and feel grateful to have had the opportunity to visit it and to take part in The Festival of Mystery. I urge everyone to try to go to that. Make it a holiday. It has to be experienced to be believed! I've heard a lot of good things about MLB from so many authors and readers. Nice to feature them on this blog. Free Shipping with a $10 purchase, piece of cake, what a bargin. I wish MLB were right around the corner! At least we can shop them online--and with their great deals, who wouldn't? So great to have the faces to go with the names. Thanks for all you do, MLB. It's always so good to know that a mom and pop shop can survive during this economy! Keep it up MLB. I wish you were here in Arlington!